Our partner language school in Liverpool, LILA (Liverpool International Language Academy) is located in the heart of this astonishing city in the city centre on the main high street. It is close to the Pier Head UNESCO World Heritage site and close to the major bus and train stations (5 minutes walk). The school is located in a newly building with modern facilities giving rise to a high quality English teaching method. 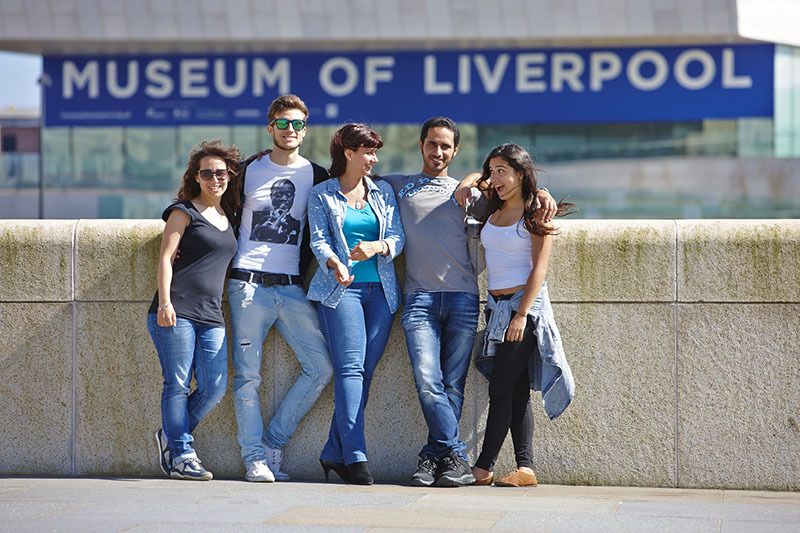 Our partner language school in Liverpool offers a highly varied program of social activities which allows you to improve your English, make new friends from all over the world and explore the surroundings in and around Liverpool. The intensive English course in Liverpool consists of either 20 or 28 lessons per week. When choosing 20 lessons, there will be 2 daily lessons of each 90 minutes. With the course of 28 lessons per week, there will be 3 daily lessons of 90 minutes each. In the language classes, there is a maximum of 15 students. The English classes are focused on practising communication skills through writing, speaking, reading and listening. The minimum course duration is 1 week. With 28 lessons per week, you will have the chance to further improve your English vocabulary and conversation skills. 28 lessons per week: from 9:00 until 12:15 and from 13:00 to 14:30 from Mondays to Fridays (including a break of 15 minutes at 10:30). Additionally, there are further classes on Tuesdays and Fridays from 14:45 until 16:15. IMPORTANT: prices are valid for students 18+. Students aged 16-17 years should select a host family 16-17 years. A double room can be only booked by 2 people travelling together. Half board in a host family includes breakfast and dinner. A supplement of € 19,- applies for special diets (vegetarian, coeliac, etc). The minimum age to stay in the residence is 18. The price stated here is for an airport transfer upon arrival at Liverpool airport. An airport transfer upon arrival at Manchester airport is € 103,- (per way). For late pickups between 12 AM and 6 AM, a supplement of € 25 p.p. applies. PLEASE NOTE: Prices are valid for students 18+. All Young Adults (UNDER 18 YEARS OLD) are required to book an airport transfer upon arrival and departure, unless they are accompanied by a family guardian on arrival/departure. If you have to apply for a General Student Visa, there is an administration fee for the Acceptance letter (prices on request). The costs for the teaching materials cover the first course book; for stays of multiple weeks, students might need to purchase further course materials on site. In 2019 the school is closed on 01/01/2019, 19/04/2019, 22/04/2019, 06/05/2019, 27/05/2019, 26/08/2019, 25/12/2019, 26/12/2019. *(when booking 20 lessons per week). For students booking 28 lessons per week: when 2 bank holidays fall in the same week (e.g. during the Christmas week), not all lessons can be made up and students will have 20 lessons in total that particular week. The Cambridge exam course covers all aspects of the Cambridge examination, improving students’ ability to communicate in English across all four language skills – listening, reading, writing and speaking. The course focuses on examination techniques and prepares students to achieve a Cambridge score suitable to enter University. The programme consists of 20 lessons per week. This course prepares for FCE and CAE. You can start this course any Monday of the year for less duration. However, bear in mind that we can’t guarantee that you can take the official exam at the end of the course, since this depends on the exact dates and level you wish to prepare for (see officail exam dates per year under the price table). Please always contact StudyTravel in order to see whether the course of your choice enables you to take the exam at the end of your stay. Students can study for any number of weeks on the Cambridge Exam preparation courses, but we usually recommend 6, 10 or 12 weeks for a proper preparation. It's possible to start any Monday with a course, but in this case, you will join a running course, and it's not guaranteed you can take the exam at the end of your course. Please contact StudyTravel to determine the most suitable starting date. In addition to the intensive course of 20 lessons, you may also prepare for the IELTS exam. During the IELTS course of 8 lessons, the students work on test examples and improve basic communication skills such as speaking, reading, writing and listening. The overall goal of this course is to be well prepared and pass the IELTS exam. The extra IELTS lessons will be held in the afternoon. Exam fees for the IELTS exam are not included in the price and need to be paid to the exam centre. The teacher training course in Liverpool prepares for the Cambridge CELTA exam. This internationally recognised certificate entitles the holder to teach English as a foreign language for adults. The course is ideal for people with no teaching experience as it is for teachers who are already teaching. - Number of lessons: 30 lessons per week (30 clock hours) from Monday to Friday from 9.00 to 17.30. These 30 lessons include 6 hours of classroom observation + 6 hours of assessed teaching practice per trainee. The rest of the lessons are devoted to study the CELTA official teaching portfolio. The individual English course is specially developed for those students who would like to study a certain subject or improve their English in any specific area. The individual English course consists of 10 lessons per week. The Commercial English course consist of 20 lessons of general English in the morning and 10 additional lessons per week focussed on “Business English”. This way, you do not only improve your general English, but you’ll also learn to use specific vocabulary in a business setting. Do you want to combine learning English with your favourite sport? Then book our English & Football programme in Liverpool, which is a popular destination amongst football fans in boasting two Premier League teams and having a rich football history. This course combines 20 lessons of English per week with 10 hours football coaching per week. You will have support through innovative coaching from highly experienced staff including ex-professional players and managers. The coaching focuses on improving individual technique as well as the importance of team work. You will also have the opportunity to play in regular competitive league and cup games! The course is available for students for all levels, aged 16 years or above (16/17 year olds do need a parental consent). A football kit can be provided at an additional cost. This course combines 20 lessons of English per week with 10 hours football coaching per week. This very attractive housing option allows students to live with a local host family from Liverpool. Host family accommodation is available in either a double or single room with half board during the week, and full board on Sunday. There is also the possibility to book a double room when you travel alone. The host families are located at maximum 45 minutes travelling time by public transport (average journey is 20 minutes). IMPORTANT: Students aged 16-17 years can stay in a host family against a young adult supplement. This supplement (see comments price table) is NOT included in the price on your price quotation / booking form but will be reflected on the final invoice of your course. There are various university residences where international students from our partner school can stay. The university residences open all year round and are very centrally located, approximately 15/20 minutes walking distance from the school and just 10 minutes to the city centre. Furthermore, there are many bars, shops and amenities nearby. The residences consist of single rooms with a private bathroom (shower and toilet). All rooms have a desk, wardrobe, chair and table. Bedding and towels are included. There is free WiFi throughout. There are shared kitchen facilities and common areas with television. The kitchens have an oven, fridge, freezer and microwave. There are laundry facilities on-site (approx. £4). Shared apartments are part of a university residence. Each apartment consists of 4-5 single room with shared bathroom and communal areas like living and kitchen. Apartments offer also Internet WIFI. Most of the apartments are located approx. 15-25 min. walk from the school. Apartments with double room are very limited and you might need public transport. This shared accommodation is self catering and includes: bedding, kitchen utensils, shared kitchen/bathroom facilities, a common area for students with a TV, onsite check in, WiFi/Internet and laundry facilities (approx £3). If you prefere to live independently in the city centre, the language school in Liverpool also offers studio apartments for one or two students. The studios have their own mini-kitchen and bathroom and are very close to the school, within walking distance. This accommodation is available all year subject to availability.